Thanks for joining me David and your firm has recently changed names, so that gives a good indication to what you’re all about. What I want to do really is just go through some of the main things around why you chose to do outsourcing and why you chose BOSS and what kind of results you’ve had. So to kick off can you tell us a bit about your firm? OK, the business was established November 1999, so we’ve been operating for almost 13 years. When I first started out we started out predominately, or with a focus on doing business advisory work and then along with that came the compliance part. Probably after about 3 to 4 years with 2 to 3 staff and we started to have some issues with staff turnover and it was really hard that you’d spend your time training the people up, they’d get used the work you’d want them to do – all your systems, all your approaches – then they’d sort of go ‘Thanks you for that’ and they’d leave and go to another firm. It was really hard from a compliance perspective just to get the work done, and so now we’ve got 2 accounting staff internally and about 1 and a half non-accounting staff. Ok, great. And why did you choose BOSS? Well it sort of links to the issues we were having with retaining staff here, and then trying to find good staff in the local area and knowing you need to do the compliance work and then not having the staff to do it, we just thought ‘this is an option’ so we trialed it and we were quite pleased with how it worked. We dropped out for a couple of years because we had found local staff and that was fine and then with a few more staff changes we thought ‘we’ll go back to the idea of engaging BOSS’ in terms of outsourcing the compliance work. Yep, fine, so it’s a definite strategy for you outsourcing the compliance work now? Oh it is for sure, and going forward that’s what we’ll do. We need to keep a couple of staff locally, and that’s fine some of it is on-the-ground work, but a lot of the compliance work, as we continue to grow and as that continues to build up, we’ll continue to build up the outsourced resources. And even as we were talking the other day, in terms of the bookkeeper role, now with having more online and net-based accounting systems that bookkeeping work can effectively be done anywhere so provided we’ve got the people trained up in Zero and Sasu and the other programs I’m looking at outsourcing that so going forward, yes, it’s a definite strategy in terms of using the outsourced resources. So how did you go about setting things up with BOSS? Were there any particular things that you needed to set up in the beginning, or get orchestrated during the first few months? Well I suppose we were pretty fortunate because for a long period of time we’d been moving down the path of paperless office so we already had scanning capabilities and our processes were pretty much aligned doing things online and electronically. So we didn’t have to make many changes in that area. We have had a few IT issues around slow internet access so we have purchased a terminal server and that seems to have fixed up most of those problems. But I think what you need to do with anything like this is that you look at your processes and how you can best do them efficiently what we actually do is when we look at it we treat the BOSS individual as part of the main partners team ; one of the staff, they’re just not physically located here. So our processes, whether someone does the work here or whether its outsourced, the processes are exactly the same. So you’ve got to make sure your processes are aligned to be able to do to all that and then have the ability to be able to scan information through on a timely basis and get that across have the ability to be able to respond to questions also in a timely manner and to a certain degree the time difference actually helps that because with India the work done late of an evening when we’re not here means that when we come in the morning we’ve got queries so we can answer those queries upfront and then they’re ready to go when the BOSS person gets in about 1pm our time. You raised some interesting points there, because I do know that clients that get the most out of outsourcing definitely collaborate a lot more and I think communicate a lot more with their accountants and you raised the point that if you’re treating them as one of your staff members and have them engaged in that way then you definitely get more out of it. So that’s good that you raised that point. So what have been the benefits of using BOSS? And what is your BOSS accountant like? Excellent! No Benod’s (?)great. He’s got a sense of humor and it takes a while to sort of sync-in to that. Technically he’s quite strong, he’s efficient. You need to make sure that you give the right parameters for him to work under, otherwise, typically, and we’ve had this experience before with someone else, they can get too locked into the detail, so you need to set the parameters around how much work they want to do in particular areas. But, you know, you build up a relationship with them and you find out more about them and their personal lives and they sort of, slowly open up to you and its great. Great. It’s an interesting point, what you’ve described there is sort of, yeah, setting parameters but also there is a bit of relationship building, isn’t there, over time you get to know someone because they’re your dedicated accountant and it just helps with the workflow. Do you think that’s true? Oh yes, very much so. Like when we set our team goals and going around all the staff members, Benod’s goal was for this next 12 months was to make me happy! To do the work to the standard where there would be no changes, and effectively make me happy, and I mean, that’s marvelous! Interesting goal. (laughs) Ok. Have there been any problems along the way? There’s always a few challenges. I think one of the first ones is the cultural aspect and that you need to be aware of the cultural differences. By that I mean in terms of work ethic, the attention to detail in terms of professionally wanting to be right to the nearest cent, whereas we add more of a materiality aspect to it in terms of, “Yes the GST might be out by $100” but if you’re talking over $600,000 in turnover, to be out by $100 you don’t need to spend a day to find out where it goes wrong. So its understanding those differences both professionally and from a cultural viewpoint. The other main challenge was just making sure that our internal processes were consistent, so that the processes were followed, so that the work would get done and the information collated so that it was all there ready to go, and not having missing information; because a part of our process is to make sure we’ve got all the information in before we start the job. We’ve had a few occasions where that hasn’t been the case. The other challenge is every now and then speaking with Benod language wise, sometimes it’s just difficult to pick what he’s saying through the Indian in the discussion. But you know, a couple of repeats and you understand what’s being said. Yep, Great, that gives a really good all-round feel I think for what is the case and how you have to handle some things, you know, you just have to work on that. And I know that I’ve had the same trouble sometimes when I talk to an Indian, I use words that they’re not used to and I have to rephrase it in a different way, because I just use Aussie or British language. Ok, so lastly, would you recommend BOSS as a service? Absolutely. We had a look at a couple of different ways of doing it before we engaged BOSS and the two main ways of doing it is one where you basically send the work over into a ‘pool’ type arrangement and the work gets done and it gets sent back and hopefully to the standard. The issue that we saw with that model is that you don’t really have that control over quality and you don’t have necessarily the ability to be able to apply your own processes to that situation, whereas the BOSS model where you engage an actual individual that works for you I believe is a far better model and it works very well. You get to put your own processes in place, your own formats that you have with accounts; the way that you want things done; additional analysis that you want done. 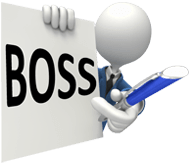 All those sorts of things that you have control over so that certainly the BOSS model and the way it works with BOSS is fantastic and I’d highly recommend people looking into it. It does provide a great solution. OK, Great! Well fantastic, I think you gave a great insight there, much better than I could in many ways!! So it’s definitely interesting to see it from your side and good to hear that it’s all working very well. Thanks very much David, thanks for your time, I appreciate that and we look forward to many years ahead of us working together.